If I was forced to only eat one Thanksgiving dish and unable to eat anything else for the rest of the meal my choose is simple, mashed potatoes. Maybe it’s the German in me, but whatever it is I love potatoes in any form they are served. Mashed potatoes can be made simply with just butter or can be a bit more extravagant like with truffle oil. Potatoes have such a neutral flavor on their own so I like to play up the flavor and add various different ingredients to mine, like horseradish…. remember the German reference above? 🙂 I usually like to add this wonderfully spicy flavor in two ways: 1. with Horseradish cream and 2. with an amazing Horseradish white cheddar cheese I usually find at Whole Foods Market during the holidays. 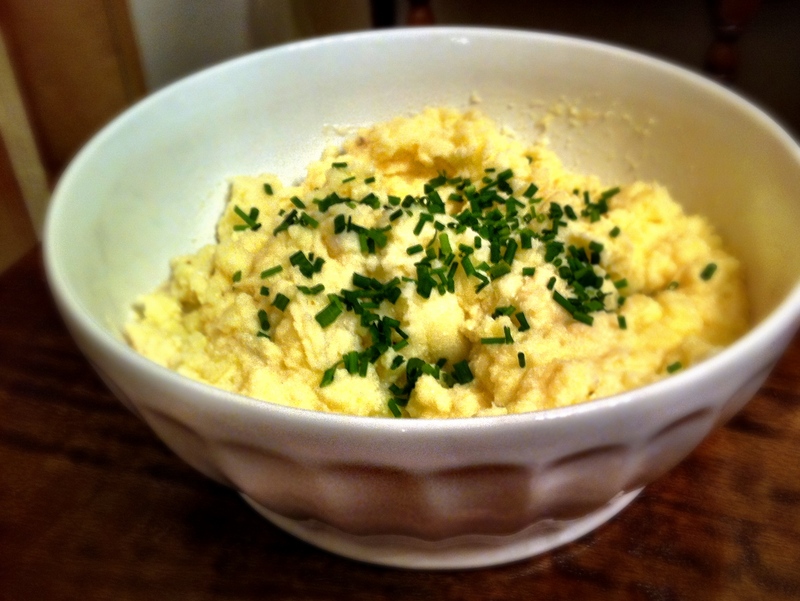 I of course add butter and sour cream to my mashed potatoes and then top it with chives…. yum! Place bay leaves and a pinch of salt into a large pot of water, place potatoes in pot then bring to a boil. Cook under potatoes can be pierced with a knife (usually 15 to 20 minutes) then drain. Smash potatoes in the large pot and then add sour cream, horseradish cream, buttermilk, butter, and horseradish cheddar cheese. Add salt and pepper to taste.